I remember it like it was yesterday. I had just gotten home from work and was walking my beagle. I got a text from my husband who asked if I knew. “Know what?” I asked. And then he told me that Steve Jobs had died. I still couldn’t believe the news. I read through all the text messages and push notifications and emails I’d received as news alerts. I was in disbelief. As our tech reporter worked up the main story, I worked on two Storifys as sidebars. The first one was on Orange County people reacting on Twitter to the news. The other I published the next day – a Storify of the exact words of the famous “Think Different” campaign by Apple that also speaks to Jobs’ thinking that shaped Apple and everyone who uses the company’s products. In a regular story, wrapping up the last day of the Orange County Fair, I was able to use social media to add valuable information to my story. I also used Storify to bring in some interesting details from the fair’s last two days. The tweet quotes show the human side of the fair’s final weekend – as told by its attendees. Here’s my presentation on mobile that I gave at the ASNE Conference earlier this year in San Diego. 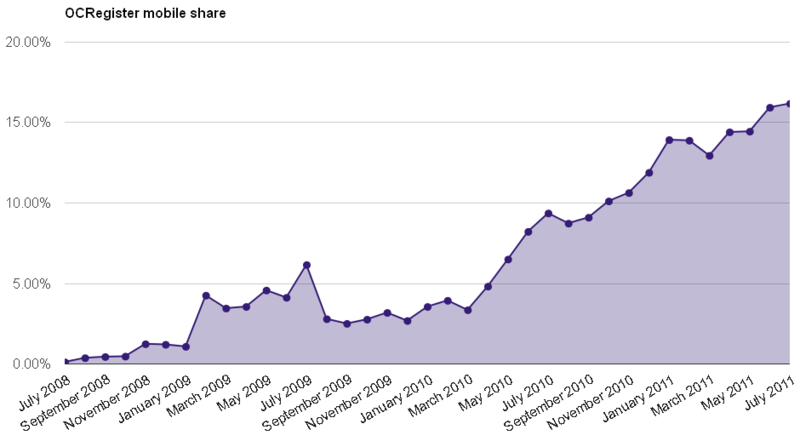 The Register mobile share continues to grow. The chart at right (click to expand) is one of many that I generate and update monthly to illustrate the past, current and projected mobile audience trends for the Register. “Mobile share” is a figure I use to explain how much of our content is accessed by people using a mobile device (smartphone or tablet). The number compares total mobile page views to total digital page views (mobile + desktop website). 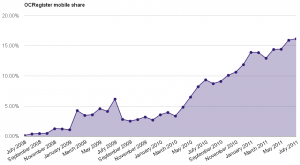 OCRegister mobile share crossed the 15% mark for the first time with 15.92% in June 2011. The Register crossed the 10% mark in October 2010 and the 5% mark in May 2010. Just over a year ago I started as the Register’s mobile and social leader. As our mobile audiences continue to grow, I’m now transferring my social role to Kevin Sablan and oversight of user-generated content to another editor. Now, I’ll be focusing on mobile. Here’s the description of my new role, written by OCRegister Editor Ken Brusic.